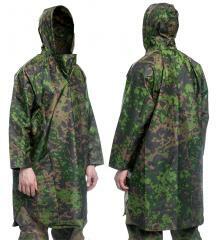 M05 camouflaged rainwear for cheap! 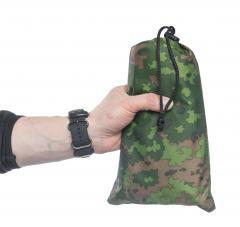 These are made of Finnish army "M13" fabric, which is probably the waterproofest fabric around. Available in two sizes. One-off lot! A simple pyjama model rain jacket with sleevelets, which means with this you can actually do something instead of just standing around. You can even carry a rucksack with it if necessary. 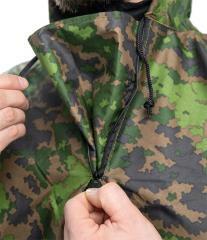 In the roomy hood there's a simple drawcord tightening and the front zipper makes life easier. Included is a small packsack, which is also useful for storing other items; the poncho can be packed up inside its own hood too. 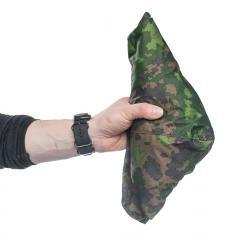 The latest issue Finnish military M13 rainwear is made from this very special, extremely strong and ridiculously waterproof fabric. 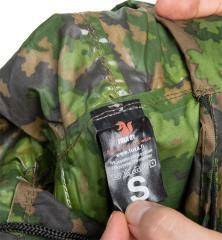 Designed from scratch to meet the insane demands laid down by the Finnish military, this is not your run-of-the-mill cheapo poncho fabric, but really, really good stuff! 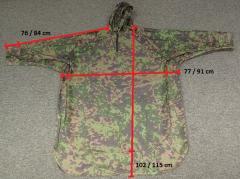 NIR compliant camouflage print. Waterproof >10 000 mm (this is really extremely waterproof). Water vapour permeability 5000 g / m2 / 24h (moderately breathable). Two sizes: "Small" and "Large". If you usually wear size Medium or smaller, pick "Small". If you wear Large or bigger, pick size "Large". Easy. The sleeves are a bit on the short side on purpose so they won't get in the way. If you just want to play it safe, pick the larger one. It just fits a bit more like a cape, no big deal. Our fabric supplier had some extra on their hands so they decided to make these simple raincoats out of it. One-off lot! These have an amazing price/quality ratio. Ihan hyvä sadeviitta. Pieni miinus tosin hupusta, se on aika pieni. Ostin Large-kokoisen, kun Smallit olivat jo loppuneet. Kooltani olen 183cm pitkä, vaatteena päällä yleensä Large. Tämä viitta tuntuu päällä melko kookkaan telttamaiselta, mikä on toki ihan hyvä juttu. Näin viitan saa mahtumaan päälle myös vaatteiden ja ehkä jopa repun päälle. Huppu tässä tuntuu olevan juuri näppärän kokoinen, varsinkin kun kaulan vetoketjua vähän avaa. Toistaiseksi viitta on toiminut kuin hyvä sadevarjo, eli nyt kun sen on hankkinut ei vesisadetta ole vielä tullut vastaan. Jospa se sadekin tässä vielä kesän tullen astuu kuvioihin.